Although Win Poker may not be high in the echelons of online poker sites at the moment, their exciting promotions and strong range of game choices suggest they won’t be waiting too long to join the elite. Win Poker stands out from the crowd of poker rooms with its brilliant propositions, which benefit both recreational players and serious grinders. Incentives such as $500 monthly Bad Beat Rewards and $500 Bluff Bonuses mean Win Poker is a poker site which keeps on giving. Although Win Poker uses the popular Playtech iPoker network and has the generic lobby and table designs, it certainly marks out its individuality. The Win Poker promotions and selection of games is far superior to the average iPoker client. 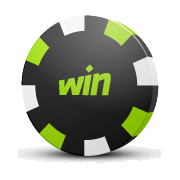 WinPoker is a venture by the Tain Network, which runs five other skins with iPoker. Tain were also responsible for the popular, but now-defunct Chilli Poker website. As is standard with iPoker skins, the software is very easy to navigate. The clear left-side panel allows you to toggle between the selection of cash games, sit & gos, scheduled tournaments and special games. Beyond each game type button are further choices between Hold ‘Em, Omaha, 5 Card Stud etc. Other prominent buttons on the main screen are the cashier and links to the Win Poker casino games. Win Poker attracts extremely loose and reckless players, seemingly bordering on the psychotic. The Best Bluff promotion encourages these maniacal players to attempt daring, risky and non-sensical bluffs. A patient thinking player can exploit these moves consistently and rapidly climb through the stake levels at Win Poker. Be ready to adapt your game to call river shoves more widely and use traps to make the most of a typical Win Poker opponent. Win Poker offers a variety of tournament structures, so slow-speed experts and turbo savants can both find their best games on the site. The Win Poker VIP Rewards scheme encourages you to play regularly and move up through the VIP levels. After you deposit and begin to gain iPoints, your VIP level increases and your deposit bonus gets released at ever-inflating rates. There is also an opportunity to exchange your points for real money, which must be a welcome bankroll boost no matter how your luck goes at the tables. Your status and deposit bonus offer can expire quickly, so make sure that you get playing quickly after your deposit and keep up a good volume of play afterwards. Win Poker has a stacked offering of scheduled tournaments. Of particular interest may be their WSOP super satellites, which give you the chance to qualify for the major events at any stake from $0.33 to $500. There are also regular tournaments at every stake level, always with strong field sizes and prize pools. The guaranteed touraments (especially the $200k, $50k rebuy and $35k) give you the chance to score massive wins. With Jackpot tournaments and non-hold’em events, there is something for every speciality. Win Poker devotes a page of its website to a very basic ‘How to Play’ guide for beginners. It gives some screenshots of the software and explains the basic rules of each game offered on the client. This may be useful for Hold ‘Em players looking to get started on an alternative game, but has very little value to experienced players beyond this. Once again, the presence of this section does show Win Poker’s admirable drive to attract new players to the site. Again, Win Poker impresses with its average traffic level. The number of online players hovers between 10,000 and 20,000 throughout the day. The cash tables and tournaments are well-filled at the lower levels, but mid-stakes and high stakes players often face long waits to start a game. The big guaranteed tournaments are very popular. Approved deposit and withdrawal methods are: Visa, Moneybookers, Neteller and Bitcoins. WinPoker is the first online gambling website to allow players to make Bitcoin payments, so this sets the site apart from the rest of the market. Ideally, there would be additional choices such as Mastercard, but WP’s futuristic ambition must be congratulated. Win Poker runs a number of Anonymous Tables, where players can play without being tracked by their opponents of data-mining websites. If this is a concern for you, then Win Poker offers you an enhanced level of protection. Win Poker also runs Speed Poker tables, which use the Rush Poker ‘quick fold’ concept. Not all iPoker sites have this benefit, so this is yet another excellent extra feature. Speed Poker saves you the time lost while waiting for hands to play out and helps you to climb the VIP Level quicker.